This article is all about how to mark a case or wiki article as a favorite or star it. This allows you to bookmark the case or wiki article within Manuscript. If you go to a case or wiki article often, this is faster than searching for it. 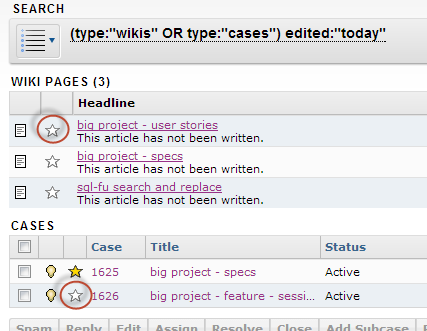 Marking a case or wiki article as a favorite, or starring it, allows you to bookmark the case within FogBugz. If you return to the case or wiki article often, this is often faster than searching for it. Access starred cases or wiki articles by clicking the “Starred” link at the top right of your FogBugz page. Star cases or wiki articles by clicking the white star, in the List View next to each case or wiki article. This can also be done by clicking the same star on the top left of the Case View page. Optionally this can be done when viewing a wiki click the star on the top right. Below are a few screenshots depicting these options. 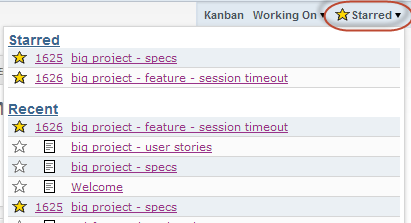 On the search bar, you can type in - StarredBy starredby:me shows cases you have starred. Check our search axis and syntax page for the star option. Under the “Starred” menu, you’ll see a section call “Recent”. This shows you any recently viewed cases or wiki articles.